Jacksonville resident joined the show to talk about the book “Grief Diaries: Project Cold Case.” We were also joined by Joy D’Elia and Tommy Bledsoe from the St. Augustine Ballet to discuss this weekend’s production of “The Nutcracker.” Also, Jacksonville singer Mama Blue performed in studio. Each year, PolitiFact awards a "Lie of the Year." This year the award was given to fake news, which played a major role in the election. More false stories were shared on social media than ever before. The popular book series “The Grief Diaries” features hundreds of authors around the world sharing personal accounts of searing life experiences. Now, a local project will be part of the series. “Grief Diaries: Project Cold Case” is being published this month. The book features 22 true stories that reveal the aftermath of losing a loved one to an unsolved crime. Backmann and Lord discussed the book and their collaboration. Lord’s daughter Carrie was murdered in Virginia in 2004 and that case is still unsolved. It’s a holiday classic, and this year there is even more excitement in store for the St. Augustine Ballet’s production of The Nutcracker. This year’s production features guest artists Jennifer Carlynn Kronenberg and Carlos Miguel Guerra, former principal dancers with the Miami City Ballet. It will be performed Saturday and Sunday at Lewis Auditorium. Kerry Speckman told us about the weekend’s events. Local blues singer Mama Blue has been entertaining Jacksonville residents for years. She is performing a holiday concert Thursday night at the 1904 Music Hall. She and two of her co-creators sang acapella in studio. Charlie Crist was once a Republican governor of Florida. He wants his old job back - as a Democrat. And that means - to make a strong case among Democratic voters - he has some explaining to do. 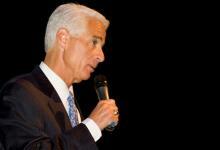 But some analysts say Crist is having a tough time spinning his Republican record. National Crime Victims’ Rights Week began in Jacksonville on Monday. Advocacy groups, including Families of Slain Children and the Justice Coalition, joined family members of victims at City Hall to kick off the observance. Many held photos of lost loved ones and wore t-shirts printed with their photos.